It’s not a new story, though. We’ve seen similar situations in every professional league and in college. Just this year, it hit Josh Allen prior to the NFL draft and Final Four MOP Donte DiVincenzo before he ever made it to the podium after winning the title. Predictable takes come out about how players should avoid social media. “If you want boring, you’ll get boring.” “There’s no value for athletes being on social media.” Of course there is tremendous value. From monetary value like sponsorships but, more importantly, the value of owning a message, doing good, engaging with your community, raising awareness for issues, using your voice for something that matters. And being boring isn’t the answer. You can use social media with purpose, have personality and have fun. And you can do all of that without using racial slurs or offensive words. Social media isn’t to blame for the words we put on social media. If racist, homophobic, offensive tweets are appearing on your Twitter account, it means those thoughts are going through your head. And if they’re going through your head, it impacts your influence in the locker room and in the community. Social Media simply amplifies and exposes who we are – for better or worse. We choose to press SEND. The problem with these tweets, though, is that who these athletes are is not necessarily who they were. We’re making judgements today about what someone said years ago. It’s fair to question if they still believe certain things, but we should also give believe people can grow and change. This in no way condoning the content of the posts, but some were teenage, sophomoric humor. I think back at things my friends and I would jokingly say to each other in middle school and high school and it makes me cringe. And we were good kids. Immature and ignorant, but good. And we grew up and learned and became better people and will pass on better lessons to the next generation. What may have been used as teenage humor is now, correctly, seen as offensive and devaluing. Who we were at 27 is not who we were at 14. Thankfully we, as a society – current political climate aside – are, slowly but surely, getting better at valuing people and understand the power of our words. Some of the tweets were quoting rap lyrics. The issue there isn’t what music people are listening to, it’s realizing context. Your audience is not your friends who listen to the same music as you. It’s the world. It’s the media and your family and coaches and fans and potential employers. Are the lyrics to that song really something you want attached to your name? We ask players two questions when we’re doing social media training. “Who are you? What do you want to be known for?” It’s a question about legacy, about reputation, about their present and future. It’s a challenge to live by their values. None of the players making headlines want to be known for offensive tweets. And that would’ve been true at the time they hit SEND, if it’s something they had been thinking about. If someone had helped them understand the power of social media and the power of their words. The answer to some of this is social media education. It must be a priority. Young people are posting without any thought of who is reading it, what impact it has not only their present but their future. College isn’t too late but it does need to start earlier. Even with that, athletic departments must make it a priority. Once the student-athlete signs with a school, they now represent that school. Don’t hope they use social media well, be intentional to provide education and tools for them to be successful. Prepare them for the platform they now have. They have to be reminded that what they do today impacts their tomorrow. There is a movement now to make athletes (and student-athletes) influencers. To get the content you’re creating into their hands because while people follow brands and teams, they are more connected to people. This movement is a good thing. Athletes are influences. The problem is it ignores the underlying need for education. It’s saying we want you to look good in this Ferrari but we won’t teach you how to drive it. A player can post 5 amazing graphics or pictures that you create and distribute to them this week, but if the other 97% of their posts are noise, inappropriate, offensive or immature, they’ve hurt themselves (and the team, university, organization). Education helps them build a strong, positive, comprehensive brand. It helps them build true influence. A next step is simply doing a social media audit. We mentioned in a previous post that individuals should do this themselves but the school (or agent or pro team or family – someone) should also help. Find old posts that you don’t want your name attached to and delete them. Could someone have taken screenshots? Of course. But you can still be proactive. It doesn’t take much time and, no matter how much time it takes, it’s worth it to them and to those who may be impacted by their words. At the root of it, though, is character. We must be educating students and student-athletes that who they are online is a reflection of their character. That who they are online must match who they are offline. That they are capable of being great leaders, but they must do the work to be leaders worth following. That means being mindful of the words you speak in person and online. That means respecting people, valuing people, understanding the power of your example (both in action and word), and using wisdom. But that doesn’t happen accidentally. Character is built over time and on purpose. We can’t hope for it, we must act on it. What student-athletes (and any of us) share online can change their life in a moment. They can use these platforms for good (see: JJ Watt), they can use them as a toy, or they can use them to do serious harm. Education helps them flip the switch from using social media accidentally to using it intentionally. As social media grows, these situations will continue to happen. In the infancy of these platforms, none of us realized how big and powerful they would become. We didn’t consider that words we typed into our phones or on a screen would live on forever. And we typed things we regret. But now we know. Now we don’t have an excuse. And we have to pass that down to the next generation. It’s on us to make sure we’re doing everything we can to prepare our student-athletes for success, not just on the court, field or classroom, but also online. To call them up to who they are capable of being, and giving them the resources that allow them to live and lead with purpose. To be leaders worth following, in sport and and in life. 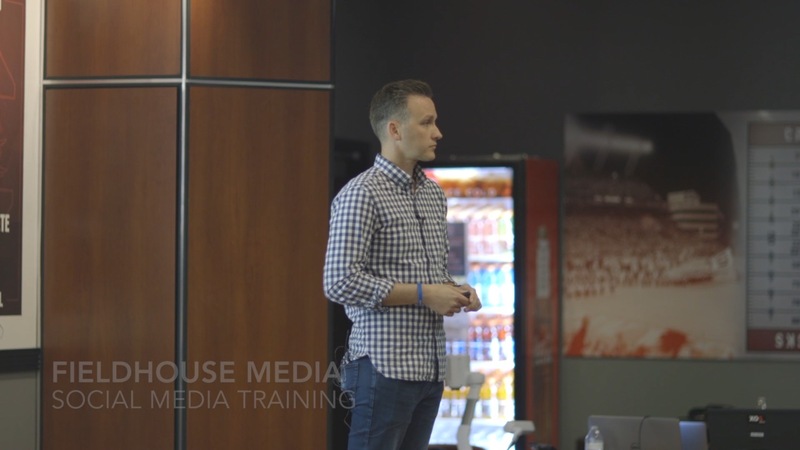 Fieldhouse Media is an award-winning firm dedicated to helping athletics departments get the most out of their social media efforts, from educating student-athletes and staff to providing an overall strategy. To find out more about us or to join the more than 150 schools utilizing our services for their athletics department, contact us today.